The administration of medication by registered nurses in a school setting is a service that is provided to promote wellness, decrease absenteeism and remove a barrier to learning. When there is a need for one of our students to receive medication in school, safe and proper administration is essential. There are currently 18 Registered Nurses employed by Detroit Public Schools Community District (DPSCD) who are responsible for the delivery of School Health Services in all of our schools. Many of our students need medication during school hours. Medication includes both prescription and non-prescription medications taken by mouth, taken by inhaler, are inject able (ie: auto-inject epinephrine, insulin and glucagon), applied as drops to the eye, nose and ear or applied to the skin. During the 2016-2017 the district’s outreach nurses saw the need to improve on the way that School Health Services training was being delivered to DPSCD employees. The decision was made to elevate our current use of computer technology in order to make training more accessible to more people. The outreach nurses used training resources from American Diabetes Association, Epilepsy Foundation, Michigan School Nurses Association and Mylan Incorporated. The nurses partnered with DPSCD IT Department, led by Jefferson Nichols to develop online training modules. A video was filmed and edited to demonstrate The State of Michigan’s Medication Policy, with the help of DSA Teacher Mr. Clinton Chico and students from Detroit School of Arts. The students provided assistance in front and behind the camera. Mr. Chico provided the voice-over on the video and a portion of the training modules. The health training modules include: Medication Administration, Asthma, Food Allergies, Seizures and Diabetes. The training consists of two parts: online courses (6 hours) with a quiz that requires an 80 percent pass rate and a hands on skill validation check-off that is required for completion of each course. 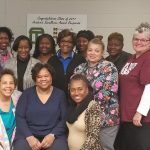 Since the roll out of the training in the Fall of 2017, nearly 600 hands on skill validation have been conducted and this is thanks to the hard work of the following DPSCD Nurses, Training Team Leader Krystal Turner, Lucia Snell, Sharon Black-Johnson, Cawhana Williams, Janice Wedlow, Glori Edge, Letrice Nash, Malvina Harris, Donna Castone and Felecia Foster-Gibson. None of this would have been accomplished without the support and leadership of Ms. Pamela Joy, Director of Nursing. It is our goal, in the near future to add to the list of health courses that DPSCD staff can access. DPSCD is proud of its registered nurses for educating our staff and community on health and safety concerns.